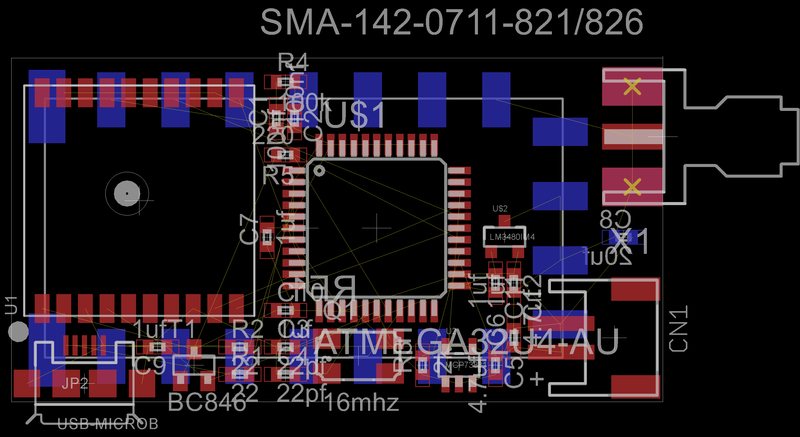 Although it isn’t quite finished, I’ve just about designed the new world’s smallest APRS transmitter. Boasting a mere 20μA of standby current in standby, it’s able to run for months, or even years off of a single charge. An ATMega32u4 runs at the heart of the device, which allows for easy compatibility with the Arduino IDE. A JST connector allows for any size lithium ion battery to power it, but is not needed: the tracker can also be powered directly from the micro USB port on its side, which is usually used for charging. A DRA818V is responsible for transmissions at up to 1W output. Of course, there’s still some work to be done. Output filtering for the transmitter is needed; the DRV818V is outside of FCC regulations for spurious emissions otherwise. Other than that, it’s just about complete and ready for prototyping!